Now is the fall of his discontent, as Jason Fitger, newly appointed chair of the English Department of Payne University, takes arms against a sea of troubles, personal and institutional. His ex-wife is sleeping with the dean who must approve whatever modest initiatives he undertakes. The fearsome department secretary Fran clearly runs the show (when not taking in rescue parrots and dogs) and holds plenty of secrets she's not sharing. The lavishly funded Econ Department keeps siphoning off English's meager resources and has taken aim at its remaining office space. And Fitger's attempt to get a mossbacked and antediluvian Shakespeare scholar to retire backfires spectacularly when the press concludes that the Bard is being kicked to the curricular curb. Julie Schumacher grew up in Wilmington, Delaware, and graduated from Oberlin College and Cornell University. Her first novel, The Body Is Water, was published by Soho Press in 1995 and was an ALA Notable Book of the Year and a finalist for the PEN/Hemingway Award and the Minnesota Book Award. Her other books include the novel Dear Committee Members, a short story collection, An Explanation for Chaos, and five books for younger readers. She lives in St. Paul and is a faculty member in the Creative Writing Program and the Department of English at the University of Minnesota. "A straight narrative delivered with acrid wit... Fitger is delightfully acerbic and self-destructive in these pages... Anyone who's taught will recognize these characters, tightly bound in their arcane knowledge and rancid grievances... A wry commentary on the plight of the arts in our mercantile era... Enrollment is now open. Don’t skip this class." "Schumacher blends satire with righteousness... The Shakespeare Requirement imagines the work of teaching with compassion and urgency." "A brutally funny jeremiad about the waning prestige of the humanities... The novel's laughter drowns out its howl of despair... A daffy little drama." 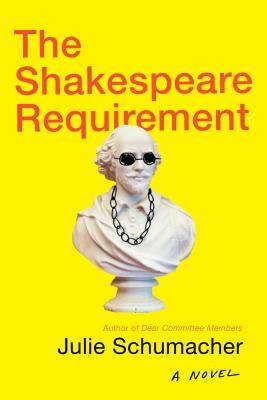 "Best among the newest campus satires is Julie Schumacher’s The Shakespeare Requirement... Campus fools have seldom been lampooned better, but beyond all the laughs, Schumacher conveys warm compassion for the admirable values of the university." "Harmonious... Words of genuine value are rare enough in a mode like the novel, but in the hands of someone like Schumacher, there’s a chance... Schumacher offers windows into the hearts of her characters, and we’re granted enough space to entertain empathy for them... Thankfully, we still have novels like The Shakespeare Requirement to remind us that there’s this thing called excellence, and sometimes people actually attain it." "A playful, sharp satire of the horrors of modern academia... Long may Julie Schumacher continue to bring Payne University to life." "Uproarious... Like the best campus comedies, The Shakespeare Requirement satirizes all manner of academic pieties while maintaining a soft spot for the embattled humanist... There's something to be said for the subtle humor tinged with pathos that hums through Schumacher's book." "An affecting portrait of the fate of the humanities in a market-driven world." "Weird and true and wonderful... Anyone who has spent even a few days around a university English department will recognize the people, the arguments, the very desks... If you're looking for a late-summer read, this highly comic novel might be the ticket." "Even funnier than its predecessor." "Kingsley Amis... Richard Russo... Francine Prose... The latest in this line of wits is Julie Schumacher. [Her] satire turns out to be a sneaky apology for her and Fitger’s profession. And she’s right. No matter how exasperating life on campus becomes, for those who want to live within books and through them, it’s still the place to be." "All the worst features of modern campus life, begging for caricature, here get their wish... Laugh-out-loud funny." "[A] wickedly smart, socially keen campus novel." 'Hilarious... Will keep you giggling until the very last page." "The Shakespeare Requirement is bold, biting, and just the right amount of absurd." "[A] wicked satire of the inner workings of the academy... Highly recommended." "Schumacher satirizes the pitfalls of academia with searing wit, skewering everything from the abominable faculty offices to the eccentric personalities throughout the university... Desperately funny... Schumacher stretches reality to the boundaries of absurdity in this raucous underdog tale." "Anyone with a soft spot for academia will discover familiar territory in Julie Schumacher’s satirical novel." "Hilarious... Schumacher’s satisfying and fun novel is bolstered by its memorable campus setting and its quirky cast." "Schumacher abandons the epistolary style of her previous novel for a straight narrative but retains all of its acid satire in a sequel that is far more substantive and just as funny... A witty but kindhearted academic satire that oscillates between genuine compassion and scathing mockery with admirable dexterity." "Laugh-out-loud... [Schumacher] wields cutting remarks that are as sharp as ever. The Shakespeare Requirement is a bitter delight, perhaps, but a delight nonetheless."